This is a similar recipe post from the earlier version of dark chocolate with candied violets and hazelnuts. Since all the candied violets brought from Vienna were gone (oh no), freeze-dried strawberries came into play. 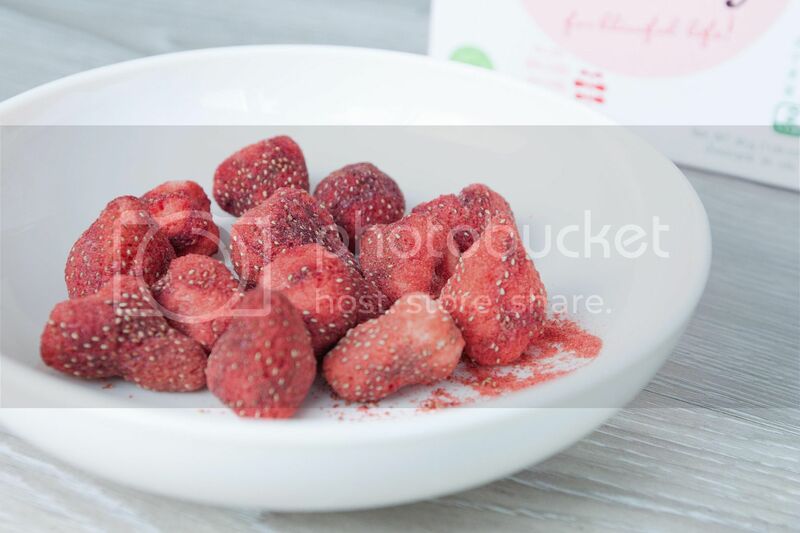 Transfer the freeze-dried strawberries to a Ziploc and gently smash them till breaking into smaller pieces. 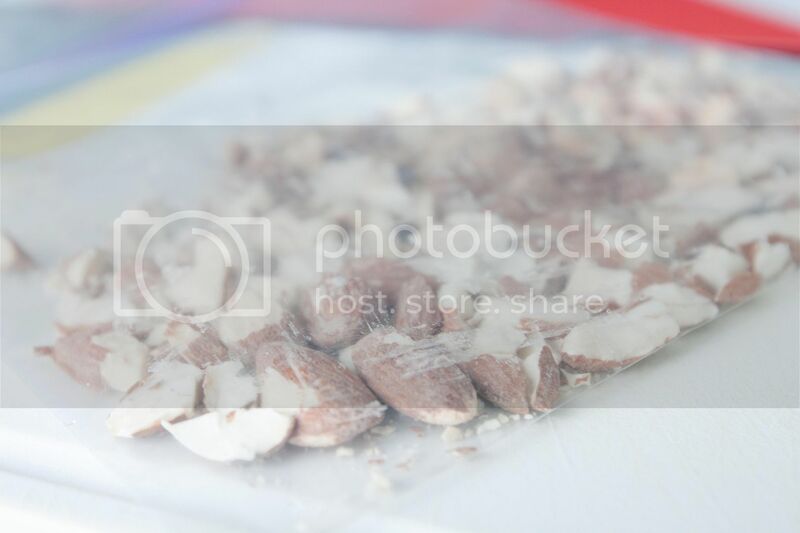 Do the same with almonds, smash till whole nuts breaking into smaller pieces. Line a baking dish with parchment paper. 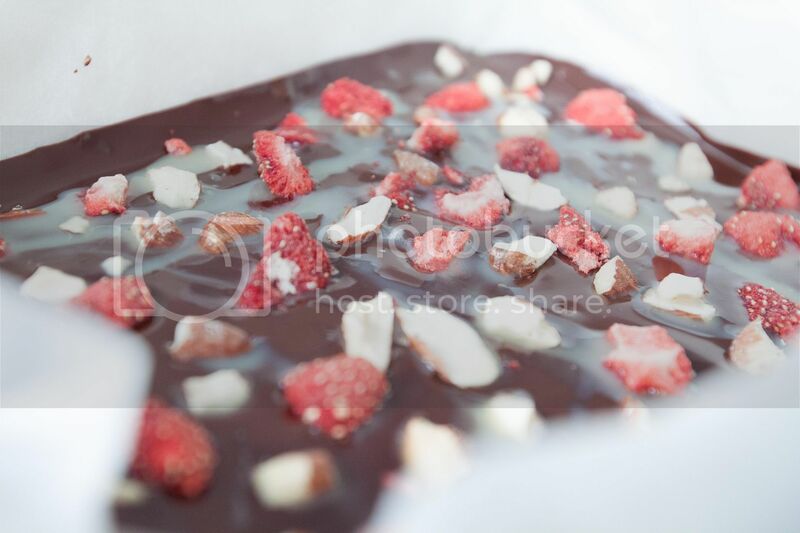 Use double boiler and melt the dark chocolate and the white chocolate separately. As for the white chocolate, if it can't melt nicely, try to add a tap of warm milk or heavy whipping cream then stir till incorporated. I used some skimmed milk for mine, not the best option but that was all I got in the fridge. As a result, my melted white chocolate looks a bit more diluted than usual. Pour the dark chocolate into the baking dish first then drizzle the melted white chocolate over to form an irregular pattern. A medium baking dish should do the trick. Just make sure once pouring in melted chocolate, the thickness resembles chocolate bar instead of spreading to a thin layer. 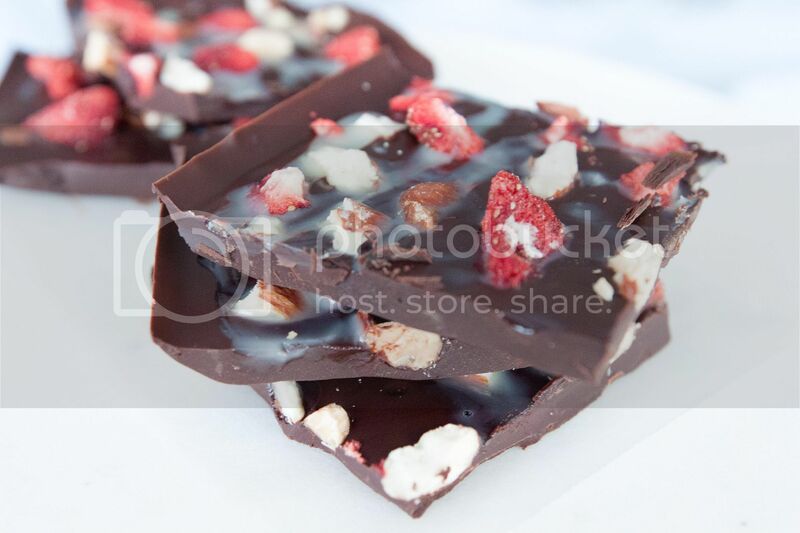 Garnish with crushed almonds and freeze-dried strawberries before the chocolate sets. Transfer the baking dish to the fridge for at least 2 hours. Once ready, take out the chocolate bar and break or cut into smaller pieces. Be creative with the toppings, it doesn't have to be freeze-dried berries. 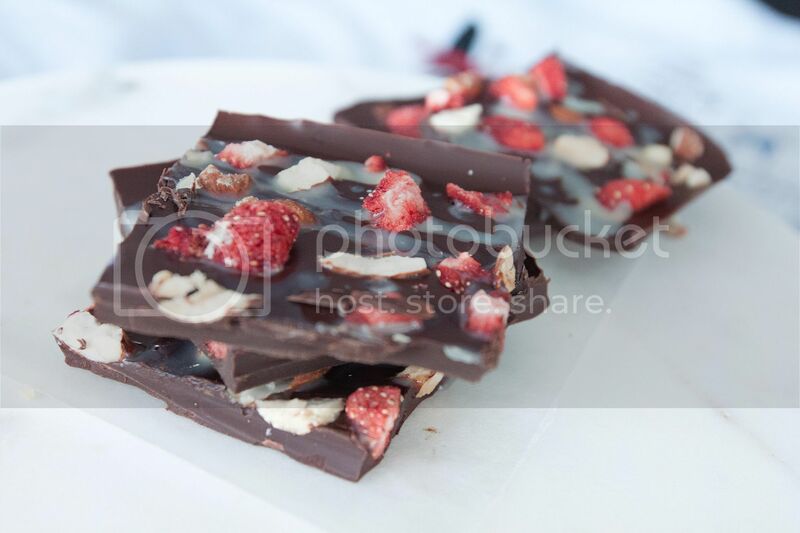 A more accessible fruity ingredient such as raisins and even figs can add a nice touch to the chocolate bar. Keep in mind that we are using bitter-ish dark chocolate and sweeter white chocolate, so which ingredient works better with these two?